Grace L. Beletsky. Beloved wife of the late Donald P. Beletsky. Loving mother of Don Paul Beletsky, Loretta (Joe) Braff, Linda (James) Osiecki and the late Susanne Beletsky. Proud grandmother of Ryan, Hunter, Garrett and Spencer Braff and Hilary and Shannon Osiecki. Great grandmother of Jasiahs and Zeneah Braff. Loving friend of many. 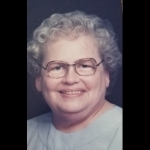 Visitation Monday, March 25th, from 4:00 pm to 8:00 pm at Olson Burke/Sullivan Funeral & Cremation Center. Family and friends will meet Tuesday morning, March 26th, at the funeral home for a funeral service at 11:00 am. Interment Ridgewood Cemetery. Linda, I am so sorry to hear about your mother. Please know my thoughts and prayers are with you.